Record-breaking Breastfeeding Challenge – and We Were There Too! Leave a Comment on Record-breaking Breastfeeding Challenge – and We Were There Too! Remember our previous article on the Breastfeeding Challenge organised by Thomson Medical Centre (TMC)? Our very first challenge – a breastfeeding challenge at that! Were you there too? We are honoured to be invited to be part of the event, and the turnout was a pleasant surprise! 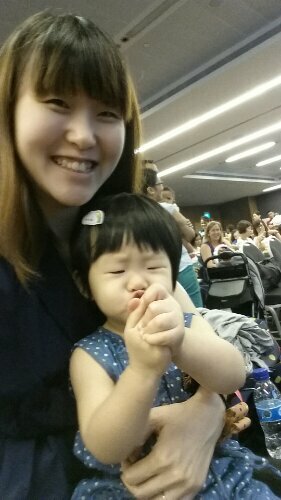 More than 200 -mummies with newborns, slightly older babies and toddlers like myself, came with their friends (they looked like they had so much fun chatting and bonding with their girlfriends!) and husbands/partners to be part of this public event. And the result? 154 mamas and bubbas helped to set the national record for the most number of mothers breastfeeding at the same time. This was accredited by the Singapore Book of Records. Mummies and babies getting ready, and daddies were requested to sit on the other side. The breasfeeding challenge is supported by Phillips Avent, Spring Maternity, Passion Card, NTUC U Family and HeyBaby SG. All mums received an Avent goodie bag and will have a nursing pillow delivered to their home – how thoughtful of them! So how was the breastfeeding challenge? Will let the pictures do the talking then! Is Vera praying hard for the event to go well? Erm, she was just doing her countdown “too too too… CHEESE!” Haha, her antics always crack me up! As of 29 August, Vera and I have been in our love-hate breastfeeding relationship for the past 21 months and 2 days. I know, it sounds crazy. But trust me, it CERTAINLY HAS BEEN crazy. Well, here’s a sneak peek of how motherhood has changed me – breastfeeding included, if you’d like to read. But yes, life does throw curveballs, miracles and strange happenings for some reasons. Breastfeeding is one of those challenges, for sure! Were you part of the breastfeeding challenge at Suntec City too? Did you join the event with your friends? Previous Entry In the Spotlight: Knead, Bake and Cook On! Next Entry Learning with edutainment by ZooMoo TV + Giveaway!